Does Jesus sit on the throne of David today as was promised Him in Luke 1:26-33? This question was posed by Dr. David Reagan to his Christmas special panel of guest Bible prophecy teachers: Don McGee of Crown and Sickle Ministries, Dennis Pollock of Spirit of Grace Ministries, and Don Perkins of According to Prophecy Ministries. Have they already been fulfilled spiritually in the life of the Church? Don Perkins: I would say no. These are literal prophecies. As the first four prophecies were literally fulfilled, I would say the last three have to be literally fulfilled as well. Dr. Reagan: You know that makes a lot of sense. It's just as logical as it can be, isn't it? The first four were literal, why aren't the last three literal? Dr. Reagan: And yet, we have the majority of Christian leaders on the planet earth today saying those last three are being fulfilled figuratively, symbolically, right now in the Church. What do you think about that? Don McGee: My question to anyone who would take that stand would be this, "What law, what rule of hermeneutics or Bible interpretation, do you apply to this?" It doesn't apply to any other aspect of New Testament scripture. Where this comes from, I don't know. I know why it's there. It's because they are trying to take a concept, a Scripture, and cut it and mold it and fashion it into a predisposed theological viewpoint. Dr. Reagan: And that's where you get in trouble. Don McGee: Anytime you do that, you're in trouble. 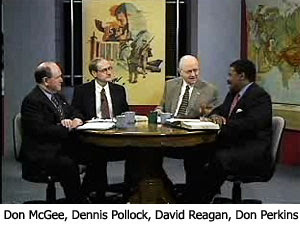 Dr. Reagan: Even the Scriptures themselves, I think, can be used to prove that these are not being fulfilled symbolically. For example, what throne is Jesus sitting on right now? Don McGee: Jesus is not on a throne right now. He's at the right hand of the Father. Dr. Reagan: He's sharing the Father's throne, but He says in Revelation that one day He's going to come back and take the throne of David. Dr. Reagan: What does this prophecy say? This prophecy says He will be given the throne of David. He is not on the throne of David right now. Dr. Reagan: He is at His Father's right hand in Heaven. And, it even says that when He comes back and takes His throne that we will be able to share His throne just as He is sharing His Father's throne. Don McGee: And, not only that, if you go back to the Old Testament and to Jeremiah particularly, in Jeremiah 3 and 17, it says that the name of Jerusalem will be changed to what? "The Throne of the Lord." I think that's very significant when you consider the Matthew 25 and 19 passages about the throne of David being in Jerusalem. In the next segment of this "Forgotten Promises of Christmas" series, we'll look deeper at the second of the three unfulfilled promises in Luke 1:26-33 concerning Jesus reigning over the house of Jacob forever. If we do not take God's Word literally, then we can make it say what ever we want it to say. I have only just learned that Emergent claims no one can know the truth because the Bible contradicts itself. They claim logic is man made rather than being a part of God's creation of language. Of course, they use logic to disclaim it's existence! Crazy!